Julius Malema is right about Emmerson Manangagwa. He is attempting to appease white supremacy at the expense of Zimbabweans. 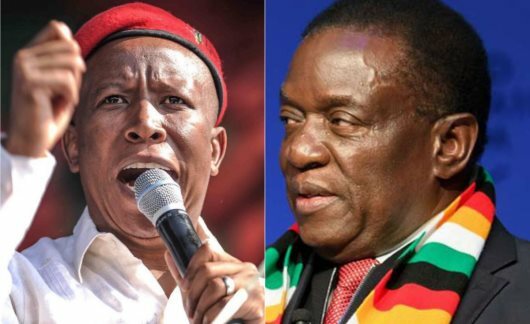 AFRICANGLOBE – South Africa’s Economic Freedom Fighters (EFF) leader Julius Malema has lashed out at Zimbabwe’s President Emmerson Mnangagwa for his plans to pay reparations to white farmers who lost land under former president Robert Mugabe’s land reclamation program nearly two decades ago. Addressing the media at the EFF party’s headquarters, Malema described Mnangagwa as a sellout who won’t finish his term as the people of Zimbabwe would soon turn on him because Mnangagwa was “reversing the gains of the revolution” by pandering to the interests of white farmers while neglecting the basic needs of the citizens such as health care, proper education and infrastructure. “I can tell you now he won’t finish his term. The way he’s going about it, he’s not going to finish his term. That country is swimming in a pool of poverty; they can’t afford basic things like primary health care, good education and infrastructure. They get money and they go and give to people who are not deserving of such money. It’s a sellout position, it’s unsustainable,” Malema said. The EFF leader also said Mnangagwa was a worse leader than his predecessor, Robert Mugabe. Zimbabwe’s Permanent Secretary in the Ministry of Information Publicity and Broadcasting Services Nick Mangwana has condemned Malema’s remarks. “South African opposition parties have this Big Brother mentality that makes them behave like some super-transnational parties? They have no respect for national boundaries and attendant sovereign autonomy of neighbours. At least our own do their grandstanding on national issues,” said Mangwana, adding that the compensation was for improvements done on the land and not for the land. Mnangagwa’s government sees the paying of compensation to white farmers as key to mend ties with the West, and set aside U.S.$20 million in this year’s budget to that end. Two decades ago former president Robert Mugabe’s government carried out evictions of 4,500 white farmers and redistributed the land to around 300,000 Black families, arguing it was redressing imbalances from the colonial era. But the land reform still divides public opinion as opponents see it as a partisan process that left the country struggling to feed itself. Malema’s EFF is pushing South Africa to expropriate land without compensation, arguing that white people grabbed land from Black people without paying for it.